For me, there’s no better way to explore a country’s culture than to explore its food scene. 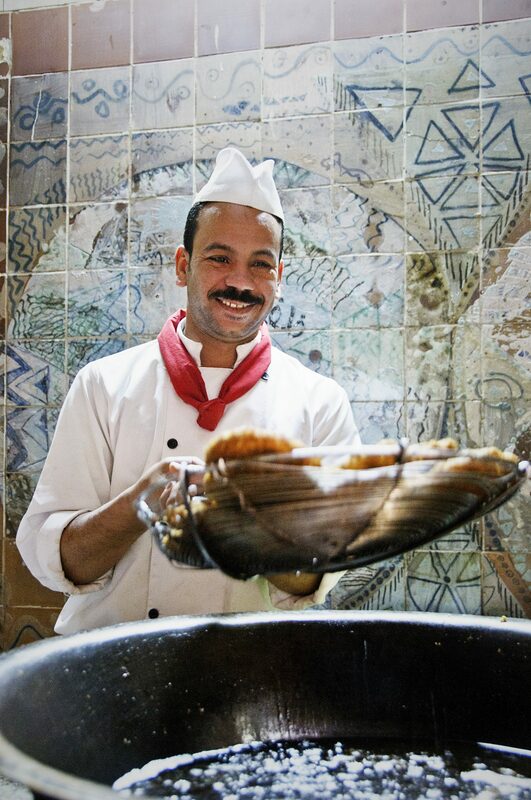 Wherever you travel in the world, you can find passionate foodies, and Egypt is no exception. While visiting Cairo with Abercrombie & Kent tours, I had two food experiences that left me feeling as if I was local. I love falafel. It’s one of my go to weekend foods in my current home city, Brussels. So when Fiby, my local expert from A&K, mentioned she knew where I could get the best falafel in Cairo and I could watch them being made, I jumped at the chance. We pulled up outside Felfela restaurant, a local institution, since 1959. Stepping through the door, I knew this was my kind of place. The first thing I saw was a chef, dressed in his whites, tossing fresh made falafel in boiling oil. Another chef appeared behind the first, with a huge bowl of dough. He showed me how Egyptian falafel differs from the better-known Lebanese version. Instead of chickpeas, Felfela’s falafels are made with fava beans and a variety of herbs. The dough is lighter, making for a fluffier centre. Pair that with a crunchy, crispy crust and you have falafel heaven. There are several dining options for enjoying your Felfela falafel. Pass by the falafel chefs and enter the quirky dining room, for a sit-down falafel experience. 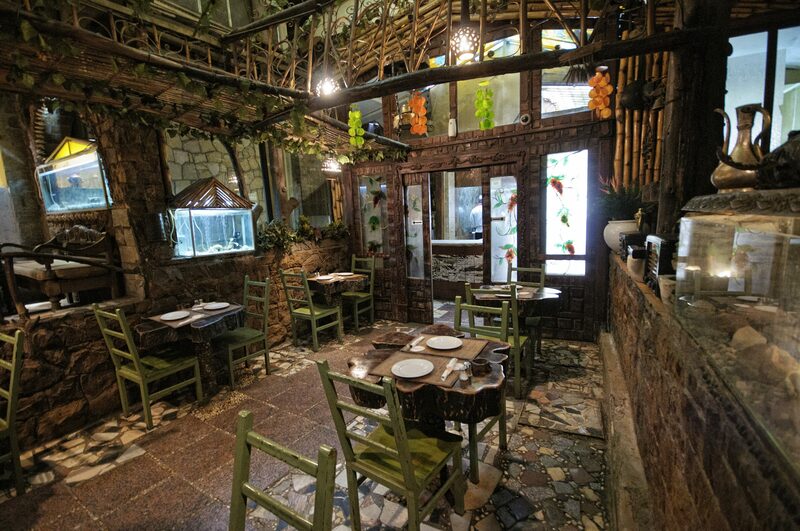 The restaurant has a jungle theme with tables made of tree trunks and greenery everywhere. There are even a few songbirds to add to the atmosphere. Along with your falafel, you can also enjoy a variety of Egyptian specialities and grilled treats. If you need a falafel on the go, just pop around the corner to Felfela’s take-away location. Here, your falafel is served inside a flatbread and topped, as you like, with plenty of tahini and fresh vegetables. It’s the perfect stop for a quick snack on the run. I arrived at my next local foodie destination to find a cloud of smoke. Rather than make me cough, this particular smoke made my mouth water. 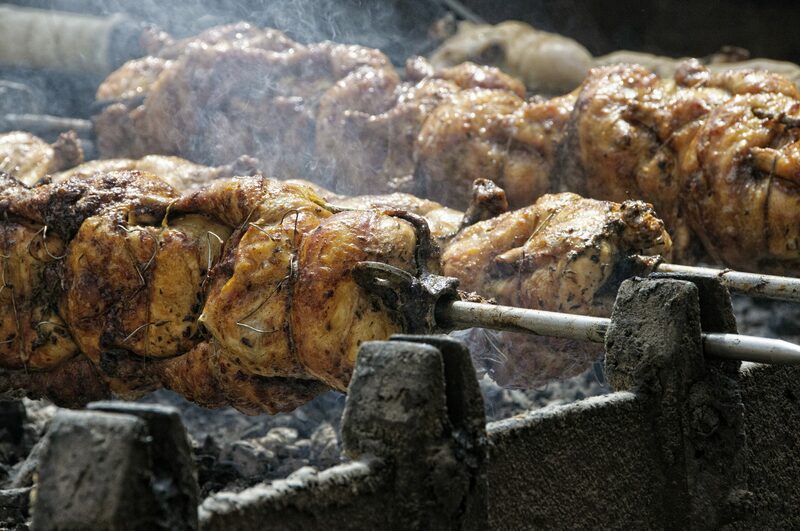 As I stepped through the gate of the Andrea Restaurant, I was greeted by row after row of rotisserie chickens, turning lazily in the charcoal haze. A man shoveling coals in a series of clay ovens stoked the outdoor grill. Dozens of chickens were cooking in various states of doneness. It takes 24 hours of marinating in a secret blend of local herbs and spices, followed by more hours on the spit, before these birds are ready for your plate. The result is well worth the wait. The chicken is meltingly tender and the herby flavour permeates all the way through. Heavenly. But chicken isn’t the only thing the charcoal fires lend their flavours to, at Andrea Restaurant. Just beyond the turning spits, sit a cluster of women. While they sit chatting and laughing, their hands rhythmically pat and shape dough into small, round, disks. 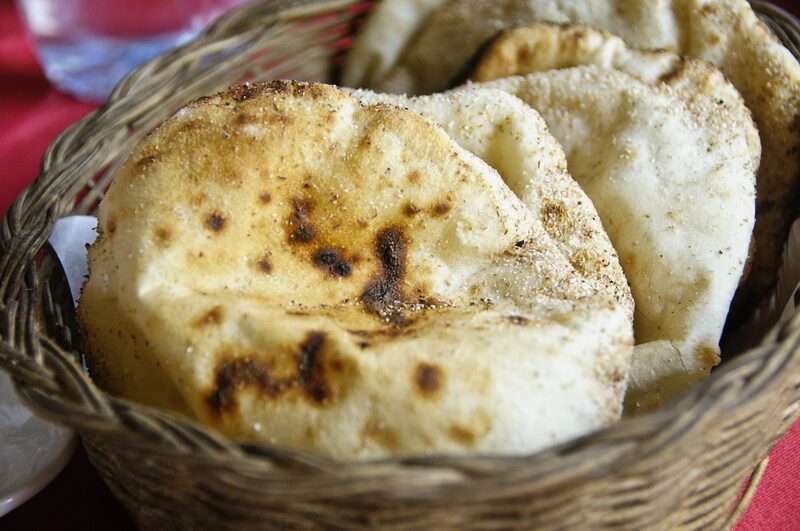 They slap the disks on the inside of the ovens and seconds later, tiny flatbreads emerge, puffed full of hot air. The hot, smoky bread is the perfect complement to the juicy chicken. Inside the restaurant, the succulent chicken and toasty bread is served with a variety of Egyptian mezze: delicately spiced meatballs, stuffed grape leaves, chunky hummus and more, round out the meal. It’s Egypt on a plate. 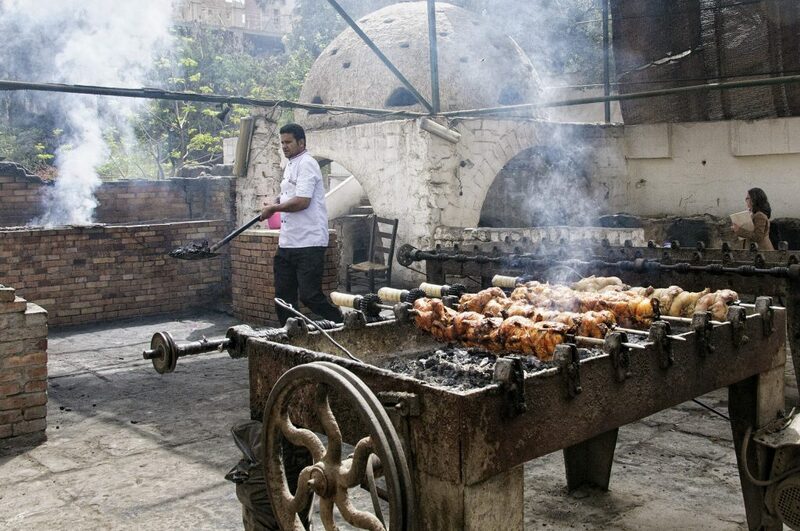 Both of these local food experiences in Cairo revealed a side of Egypt I wasn’t expecting. The local passion for food is deeply ingrained in the culture. 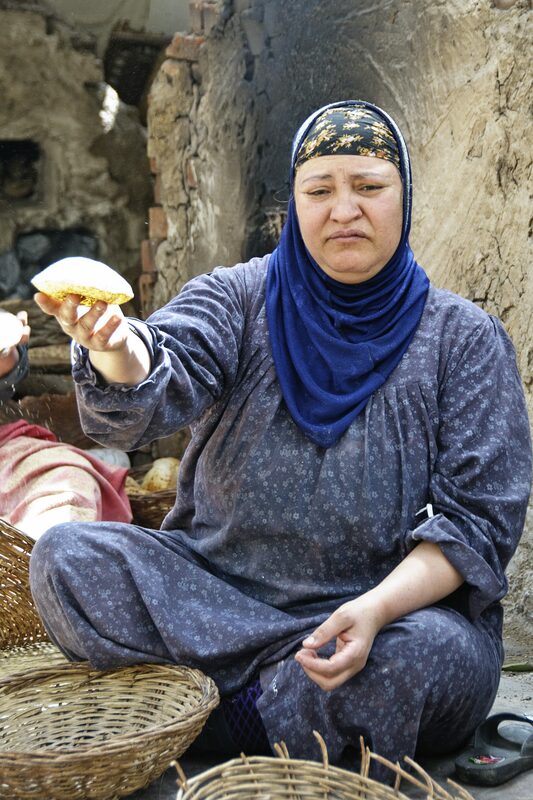 Discovering the food of Egypt helped me relate to the people who create it and relating to locals is what travel is all about.